B Michael Visits Bell's Fine Clothing - Bell's Clothes, Inc.
On April 13th, Bell’s Fine Clothing had the pleasure of partnering with renowned New York fashion designer B Michael, founder of B Michael America. 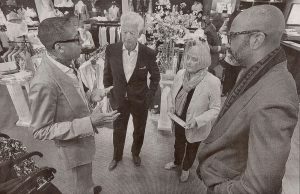 The designer, as well as CEO of the company, Mark Anthony Edwards, paid Bell’s a visit during their weekend in Winchester and presented the store with its first rack of B Michael dresses. B Michael founded his namesake company in 1989, and has been a staple in the fashion industry ever since. The brand’s focus is to design pieces for women of style, grace and class. His designs have been worn by several celebrities such as Beyoncé, Halle Berry, Cicely Tyson, and Lena Horne, just to name a few. Michael also designed Whitney Houston’s wardrobe for the film “Sparkle”. Edwards also mentioned that independent stores focus more on the designs and fashion themselves rather than the marketing behind it. If you’re looking to own a piece of New York fashion from B Michael’s collection, look no further than Bell’s Fine Clothing. Bell’s is now home to a selection of B Michael samples that can be ordered and custom-made. Stop in today to see the brand new additions as well as Bell’s Spring Fashions.